What benefits can your organization achieve with Big Data? How to spot patterns in large quantities of enterprise data to improve performance and find underlying pattern that can benefit the organization? How can enterprises obtain a competitive advantage with Big Data? The Enterprise Big Data Professional (EBDP) course discusses the theoretical concepts of Big Data and subsequently applies this knowledge to a real-world case study. 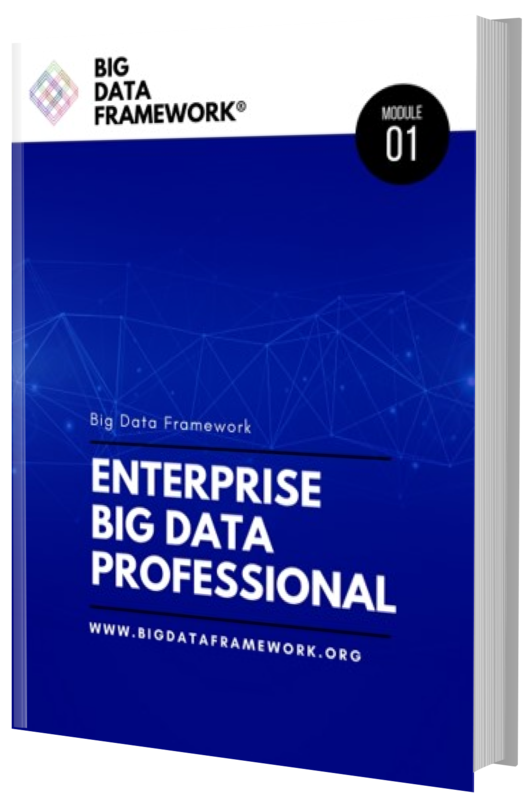 The Big Data Framework provides a holistic and compressive approach for enterprises that aim to leverage the value of data in their organizations. The framework covers all the essential aspects of Big Data that are necessary to understand and analyze massive quantities of data. The Enterprise Big Data Professional (EBDP) course will provide delegates with a fundamental understanding of Big Data and related technologies. In this extensive program, delegates will learn how to adopt, adapt and apply the fundamental principles of Big Data in their own organization to realize business benefits. The Enterprise Big Data course is the first level of the Big Data Framework course curriculum and certification program, that is globally recognized and accredited by APMG-International. The curriculum provides a vendor-neutral and objective understanding of Big Data architectures, technologies and processes. The Enterprise Big Data Professional course is a vendor-independent program that is dedicated to applying Big Data best practices towards enterprise organizations. The practical examples from real-world situations will help to gain a better understanding about how Big Data can be used in actual situations. Explain the history and context of Big Data in comparison to traditional data analysis techniques and solutions. Describe the fundamental characteristics of data analysis, big data, machine learning and artificial intelligence and the differences between these concepts. Describe how to formulate a Big Data strategy that underpins the business drivers of Big Data and Big Data solutions in order to capture the value proposition of Big Data. Discuss the high-level principles and design elements of contemporary Big Data architectures and explain their core benefits. Explain fundamental Big Data algorithms and processing techniques in order to select the appropriate techniques to solve practical Big Data problems. Identify how to apply the Big Data processes that are necessary in enterprise organizations to capture value from massive quantities of data. Explain key functions, roles and competences in organizations that are necessary to capture long-term value from Big Data. Understand the importance and concept of Artificial Intelligence and its relation to Big Data methods and solutions. The Enterprise Big Data Professional qualification is an entry-level course for all processionals that aim to get a basic understanding of Big Data terminology, core concepts and Big Data solutions. The course will provide an overview of existing technologies, but will not go into programming or implementation. There is no mandatory prerequisite to obtain the EBDP Qualification. All Enterprise Big Data Professional examinations are administered through APMG-International and can be taken either paper-based through an Accredited Training Organization or online via the website of APMG-International. The official EBDP course syllabus and sample exam are all available for download on this page. The Syllabus explains the structure of the exam. The Sample Exam provides a mock exam for practice. The Rationale provides correct answers to the sample exam.